list on-site during Parade Check-in. Check-in opens on June 29th at 8 AM. Contact the registrar if you have any questions. As you can see by our 2009 Parade Logo - there is a Porsche and Colorado Mountains. We hope this instills you with the urge to exercise your Porsche at our Autocross event in the cool, clear, 9,300’ mountain air. The site of the 2009 Autocross will be located just across Highway 6 near Keystone Village. There will be constant shuttle service for spectators to and from the Village. All Porsches entered in the autocross must pass the Parade - Safety Technical Inspection. Check the Parade schedule for time and place of Parade Technical Inspection. Due to the size of the venue, we may have to limit Autocross participation. Entrants registering March 3rd – 5th will receive priority for the AX. Please be aware that this is a “Mountain lot style” course. But do not let that fool you, it is a challenging 1st/2nd gear, one-minute course. The Parade Autocross Committee has a fun and competitive event organized at this outstanding mountain ski resort. Your time to report at the Pre-Grid( Montezuma Lots) will be given to you at “Check-In” at the Keystone Conference Center. You will need to stop at the Autocross table and pick up your Group Assignment and time to arrive at Pre-Grid. Your assigned Group may contain more than one Class of cars. You will begin your event at the Pre-Grid, also known as The Montezuma Lot. There you will unload all loose items from your car, including floor mats and present your car, according to your Group Assignment, for a final Top Tech and Drivers Meeting. Once you have completed your Drivers meeting, you will be instructed to proceed, with your Group, behind a PACE Car to the Start-Grid for your Three (3) timed runs. You will need to take only those items needed during your timed runs to the Start-Grid such as helmets, air pressure gauge, etc. 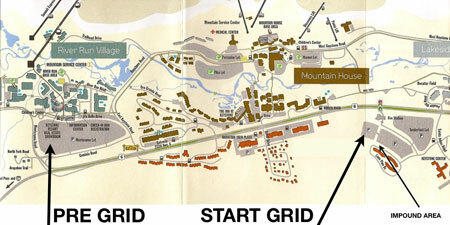 The Start-Grid is located at the Tenderfoot Lots. The actual autocross course at the Tenderfoot lots is approximately one (1) mile from the Pre- Grid, Montezuma Lots. The Pace Car will lead each Group from the Pre- Grid to the Start Grid. Once your Group arrives at the Start-Grid, you will be formed into lines and set to begin your timed runs. When you have finished your three timed runs, you will be directed to Impound, a short distance from the Start Grid and present your car for inspection according to the PCR’s. Once released from Impound you may return to the Pre-Grid area (The Montezuma Lots) to pickup any items you may have left there. Due to the site restraints there is no spectator parking available at the Autocross site. We anticipate there will be limited seating area available for spectators, which will be accessible by walking a short distance from the Convention Center area.